At Uncle Bill’s Pet Center, we not only offer Nylabone dog toys for sale, we also employ a highly trained staff that can assist you in finding the appropriate toy for your dog. 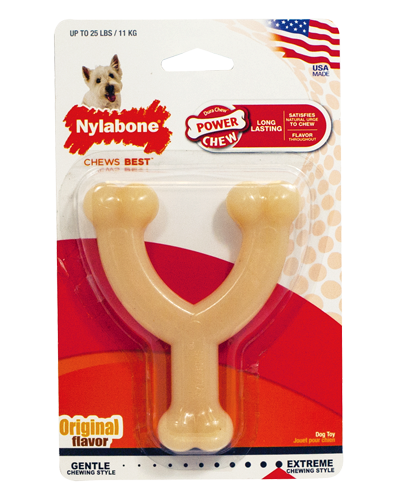 Made with tough, durable nylon, the Power Chew DuraChew Wishbone Chew Toy was designed for your powerful chewer. It provides long-lasting enjoyment, satisfies your dog's natural urge to chew, and encourages positive chewing habits. Plus, the bristles raised during chewing promote clean teeth and help control plaque and tartar buildup. Go ahead and give your dog a Nylabone! We will be glad to work with you to ensure that your pet enjoys quality toys for optimal health and happiness by providing the best selection and value on premium dog toys for sale in Indiana.